Individual hydrochlorothiazide test results (as maximal increase in fractional chloride clearance) in patient groups. Values are expressed in a log scale; horizontal line corresponds to the lower normal value (2.3%). GS, Gitelman syndrome (▴; GS2d; ▵; GSa–c); BS, Bartter syndrome (•, BS type I; ○, BS type III); PB, pseudo-Bartter syndrome (♦, furosemide abuse; ⋄, habitual vomiting). ↵a SLC12A3 sequence numbering according to GenBank entry X91220. del#, exon deletion; fs, frameshift; homo, homozygous mutation; IVS(#), intron; M, missense mutation; F, frameshift mutation; N, nonsense mutation (stop); SS, splice-site mutation; −, undetected mutation. ↵b Genetic variants are shown for the two alleles. ↵a Genetic variants are shown for the two alleles. ↵a Sequence numbering: CLCNKB according to GenBank entry Z30644; SLC12A1 according to GenBank entry U58130. ↵a Data are means ± SD. aldo, aldosterone; BS, Bartter syndrome; CCr, creatinine clearance; GSa-c, Gitelman syndrome in children-adolescents; GSad, Gitleman syndrome in adults; PX, plasma levels of X; PB, nontubular hypokalemia; UX/VX, urine excretion of X; UCa/UCr, ratio between calcium and creatinine excretion. ↵b The ratio between individual values and maximal normal level for the assay. ↵c P < 0.01 versus BS and PB. ↵d P < 0.01 versus all other groups. ↵e P < 0.02 versus GSa-c and BS. ↵f P < 0.05 versus all other groups. 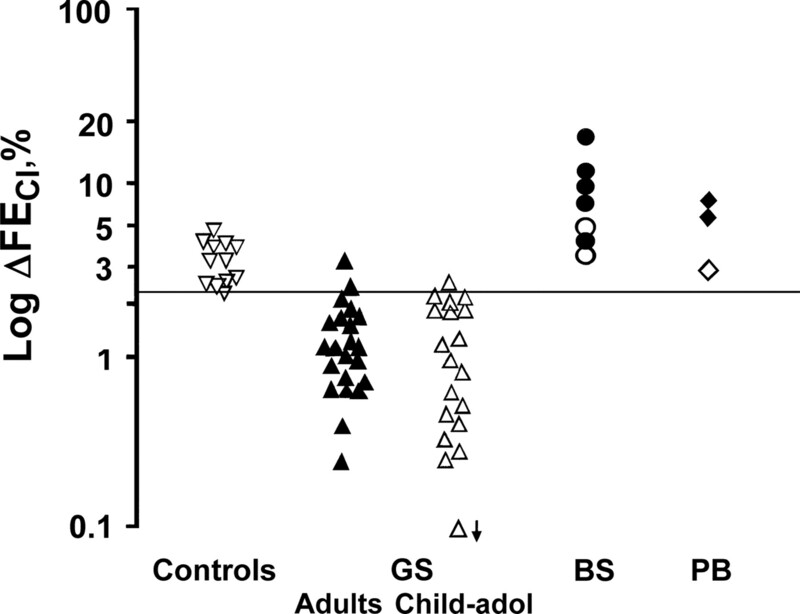 ↵g P < 0.02 versus GSad and GSa-c.
↵h In our adult population: 60 to 380 mmol/d. ↵a Data are means ± SD. b, basal clearances; ▵, maximal increase; EEX, fractional excretion of X; HCT, hydrochlorothiazide; Max, maximal clearances. ↵b P < 0.05 versus BS. ↵c P < 0.001 versus controls. ↵d P < 0.001 versus BS. ↵e P < 0.05 versus controls. ↵f P < 0.01 versus controls. ↵a According to the biochemical profile. ↵b According to the HCT test.